2) Lower profile scope mount. Anyone use an EOTech + Dual magazine coupler? Anyone one found a lower profile scope mount that works well with EOTech? Perhaps someone has had a great experience with Dan Haga's solution? Last edited by Inigo Montoya on 02 Aug 2015, 03:51, edited 1 time in total. What's a Gen 4 PS90? Do you have a older Tri Rail? 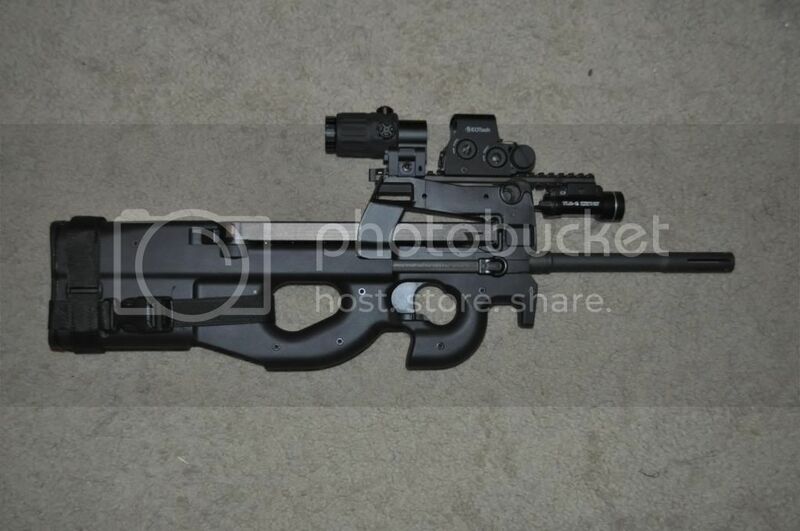 Or a standard PS90 with the factory added rail? We have updated and much better versions of the sight that is supposed to be on on your PS90. Sorry for creating confusion. My PS90 is a new standard model with the factory added rail. I do not own one of the older models like the USG, or other earlier versions that came with a sight. You make a good point that a fourth option for me is to purchase the types of sights that were designed specifically for the PS90/P90 and abandon my EOTech sight. Getting back to the OP, can anyone comment on cheek-weld with an EOTech on a PS90? I'm in the same dilemma as you are. I don't think there's a solution to use an EOtech with a PS90. I've found the factory supplied picatinny rail to be completely worthless. What I'm looking into is the TROS mounts. I think that's really as good as it gets with non-factory sights. I did some testing with my comp m4, I basically just taped it to the receiver at the same height as those TROS mounts would put the comp m3. For me, it was perfect. It was a little bit higher than it would be on an AR with absolute co-witness. Feels like about the same height as lower 1/3rd, maybe a little higher. But the heads up position felt good considering that the P90 was designed for close quarters. I would like to get one of the ring sights, but I can't find them anywhere, even used. The company who makes them doesn't seem to be operational at the moment, or at least they don't seem to be maintaining their website. In any case, I think the Aimpoint is probably a much better close quarters sight, and it doesn't sit much higher than the ring sights with the TROS mount. EDIT: Okay, apparently the company IS still in business. Now if Elite Ammunition would just get those ring sights back in stock! Last edited by HansTheHobbit on 24 Aug 2015, 16:18, edited 1 time in total. HansTheHobbit wrote: I'm in the same dilemma as you are. I don't think there's a solution to use an EOtech with a PS90. I've found the factory supplied picatinny rail to be completely worthless. What I'm looking into is the TROS mounts. Actually we are Ringsights importer to the US and carry all their current line of sights including versions never before sold here. I just replaced the factory sight with a Damage Industries 1913 Extended Optic Rail. Hell, I can even hang my NV scope on it with the Eotech (not that I'd want to use it that way...). This is not unlike the issue with a M14/M1A/EBR. With these, an after market cheek rest is good option although they are very different rifles. I think this could be done for a PS90 if the demand were there and precision shooting was a necessity. Take a look at my mounts. I hated the FN sight, I don't really like the EOTech because it washes out in bright sun. (And on this system it's just to big.) If you try a T-1 / T-2 reddot on this mount you'll get a perfect cheek weld, and the aiming point is much closer to the bore. If your staying in close (CQB) then I would recommend the RMR.